Chief Executive Officer of ENYO Retail and Supplies Limited, Mr. Abayomi Awobokun, has commended the Federal Government on its effective petroleum distribution chain across the country in the last two years. Awobokun gave the commendation during the official commissioning of the ENYO `Olowo Eko’ retail outlet station at Ikate Bus stop, Lekki, Lagos. According to him, the company commended the government for what it has done so far in the supply chain network and in ensuring there is no shortage. 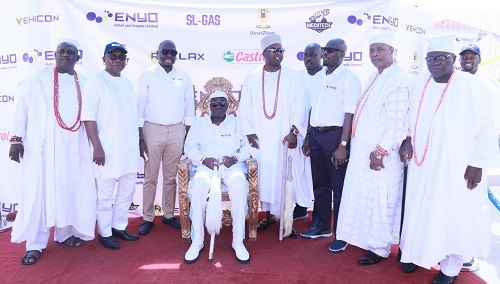 “We have not experienced any products shortage in the last two years and our affiliated company, Folawiyo Energy Terminals, is one of the biggest in the country. This has been very efficient and also able to cater for the industry demands in the retail market. Government must be commended on how it manages the supply distribution of the products, while also continuing to explore deregulation. I don’t think deregulation should be rushed; I think it should be a journey that must be embarked upon carefully and intelligently. So, I am very satisfied with the progress so far made. We must continue to move wisely and gradually towards deregulation,’’ he said. Awobokun said that at ENYO Retail and Supplies Ltd., the company’s goal is to focus on expanding its distribution capacity to more states in the country and to continue to deploy affordable technology to bring consistent value to its customers. “We are investing profoundly in improving the customer experience at all our points of sales. Our primary determination is to deepen the customer services experience in the fuels retailing industry with the assurance to all customers that at our points of sales and filling stations, a litre is a litre. We seek to be the most trusted brand in the Nigerian market. We are consistently investing in capacity development, sales infrastructure and in our supply value chain to achieve this goal. As part of its future plans, Enyo Retail and Supplies aims to increase its footprints with additional ultra-modern filling stations. This will include a lifestyle space ranging from coffee shops and other amenities which will showcase the customer-centric nature of the organisation,’’ he added. Awobokun said that about N8 billion had been invested in the downstream retail business with the aim of expanding the company’s market share in the downstream sub-sector of the oil and gas sector in the country. He, however, reiterated the company’s commitment to Nigeria and outlined its achievements in less than two years of operation in the country. “We are about 18 months old. Our major investor is Folawiyo Energy and we have invested over N8 billion to build 56 retail stations across Nigeria. We have 17 filling stations that are under construction and we are placing due importance on technology-driven innovations because we are in a competitive environment. We also are trying to change the narrative and focus on training and career growth. We are set to be a major player in the near future because right now, nothing much is happening in the sector. Since we are focusing only on retail business, our business model is based on the available margin,’’ he said.